Join argodesign for an interactive studio tour that offers an inside look into the design process behind their first incubator project: an immersion coffee brewer scheduled to hit the shelves in early 2019. We are designers and inventors. We love design – for the technology, for the simple joy of the craft, and ultimately for the experiences we create – and we put it to work for our clients. Modern design has outgrown its original remit. Today, designers are modern-day inventors, uncovering unmet needs, conceiving of new products, and giving form and function to new concepts through a wide range of craft and science. In this interactive tour of our Austin studio, we’ll explore the future of digital experiences and interfaces through demonstrations and thoughtful conversation. Guided tours will begin every :30 minutes, with argonauts taking attendees through four different stations throughout the studio: Stäk, Interactive Light, Magic Leap, and CognitiveScale. The tours will begin at the following times: 2:10, 2:40, 3:10, and 3:40. We'll have light snacks and beverages to enjoy as well. Our team will also share an inside look into the design process informing our first incubator project, Stäk, that’s coming to market in early 2019. Stäk is our first consumer incubator project that's coming to market in early 2019. We're excited to share an inside look into the origin story, design process, and future vision for an entirely new focus area here in the studio. 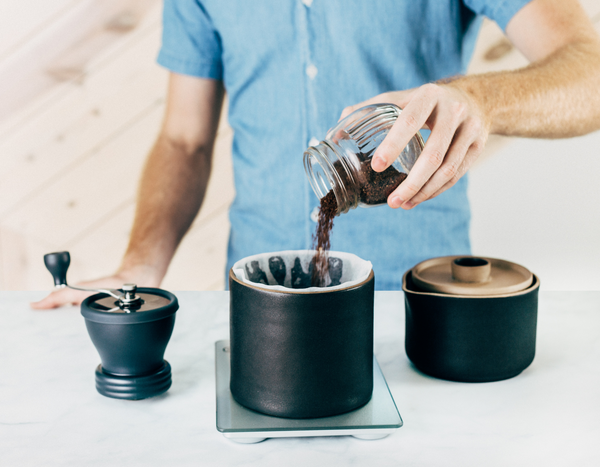 Stäk is an immersion coffee brewer designed for those who love not only coffee, but also the beautiful, intentional process that goes into creating the perfect cup. Crafted in-house by a small team of designers, Stäk is made of elegant stoneware ceramic with three stackable components: a funnel, lid, and carafe. When stacked, a hidden valve is engaged to effortlessly filter coffee throughout the unit, creating a ceremonial experience informed by thoughtful design. There were multiple iterations, trial and error to achieve a final product we’re all proud of. The Stäk team will provide insight into the process from the earliest sketches to physical prototypes, and provide demos that show it in action. argodesign is a product design consultancy, growth partner to entrepreneurs, and incubator of new products and experiences. Our team of experienced designers and expert technologists create products that hide their technological process, evoke delight, and demonstrate simplicity and value. There is a parking lot onsite, and ample street parking nearby.